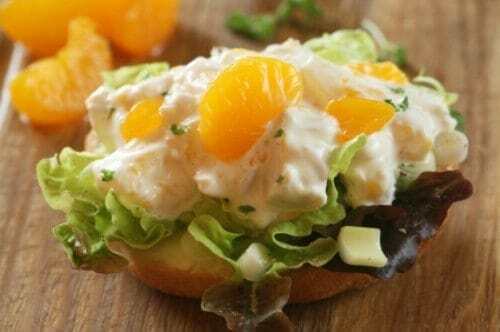 You can make a delicious fruity chicken salad, it is so easy to do. This chicken salad adds grapes, celery, and mandarin oranges, its so good. Fruit tastes amazing in a chicken salad. Combine the first five ingredients in a bowl. Combine mayonnaise, onion, and if desired, salt, add to chicken mixture stirring gently. Spoon onto lettuce leaves. Loved this the first time, I can’t wait to make it again.